Boy, this summer has seen its ups and downs with the heat. We couldn’t have asked for better weather during the Waterfront Blues Festival, but whether the weather has been hot enough for you all, the blues happening around the Northwest has definitely been sizzling. Festivals, concerts in the parks, touring acts, or just plain hanging out in your favorite local venues, the music has been on fire all summer so far. And we’re far from done! Keep that summer heat going and make plans to attend the August Cascade Blues Association General Membership Meeting on Wednesday, August 5. 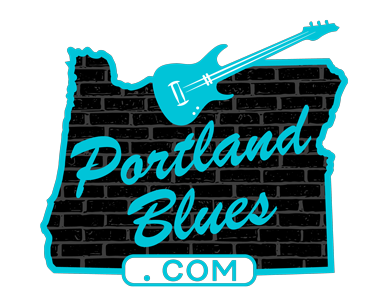 We’re going to present two fun acts who should not be strangers to anyone familiar with the Oregon blues community. Opening the night will be our 2016 Journey To Memphis solo/duo winner, David Pinsky. This is his second time winning the competition in the past three years as he represented the CBA in Memphis in 2015 with his long-time partner Phil Newton. This time though, David took the prize as a solo artist. If you’re not aware of David Pinsky, he plays the blues in a traditional delivery of simply his guitar and his voice. 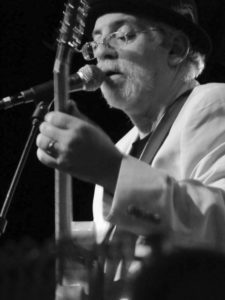 He has been involved in many projects throughout his career, starting his own band The Rhythm Kings in 1988 and being involved with putting on events in Southern Oregon. More recently he has ventured into a solo career while still often playing front porch blues with Broadway Phil Newton. He lives in the Medford area, so you can see him play at many of the Southern Oregon Wineries within the intimate setting of tasting rooms. Over the years he has shared the stage with BB King, Bo Diddley, Elvin Bishop, Junior Walker, Otis Clay, Leon Russell, Tower of Power, and many other notables. Truly an audience friendly performer, you’re guaranteed to smile when David Pinsky performs. The second set of the night will bring first-time CBA meeting performers Ma Fondue to The Melody Ballroom. Ma Fondue was born when their members first jammed together at a house party of the band’s original bassist Dale Turnbull’s home in early 2013. There was a heart-felt instant musical chemistry and with encouragement by their friend, Brad Rehn, they decided to form a new band. Each member had interesting ideas for tunes to cover and their catalog grew organically into a broad selection of genres. 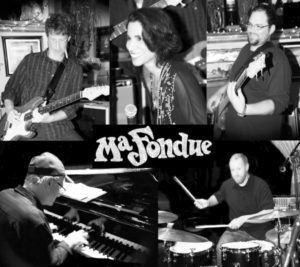 Ma Fondue fills their shows with spirted performances of soul, R&B, rock, funk, and blues. When Louisiana born bassist Ben Rougeou took over for Turnbull in 2014 he added his own unique New Orleans flavor to the project. Drummer Sean Patrick Martin hails from Michigan and has been in Portland for nearly a decade. Mike Zilis on Keyboards grew up in Chicago but has been playing in Portland since the the 80s. Guitarist James Mason grew up in Sherwood and has been gigging in the area since ’98. Vocalist Nayibe Rojas has called Portland home since ’86 after growing up in Alaska and Washington. Together they blend into a vibrant and fun-filled combination that brings excitement and dancers to their shows. When entering The Melody make sure that you pick up your lucky drawing ticket for a chance to win prizes including blues CDs and concert tickets. Also, for just $1.00 per ticket, you can get into our winner-take-all multi-CD drawing put together just for this meeting, knowing that each ticket purchased will help support the CBA in a variety of means to meet their everyday business expenses. Come on out this month. The meetings are early enough that you don’t have to worry about waking up on time for work the next day, they’re family friendly, and a great place to catch up with your friends in the blues community while hearing some fantastic music. Don’t miss out, we’re looking forward to seeing you there!